The thoracic spine gives stability and protection to the internal organs and the chest area. Thoracic back pain can be caused as a result of trauma, sudden injury or through strain and poor posture over time. Stand straight with a tightened torso. Take your hands behind your back and try to clasp them. Maintaining the position, and try to extend your neck backwards by looking up. Lie down flat on your stomach. Slowly try to lift your shoulder and neck up as much as possible. Hold in this position for10 seconds. Resume to original position of lying flat on the ground. Repeat this 5 times. Take a long stick or rod. Stand straight with your feet hip-width apart. Hold the stick and let it rest on your shoulder behind your neck. Rotate your upper body from left to right as much as possible. Properly support your lower back around the ball. Clasp your hands behind your neck without pushing the head forward. Take a deep breathand sink onto the ball. Slowly extend the upper part of the spine backwards. 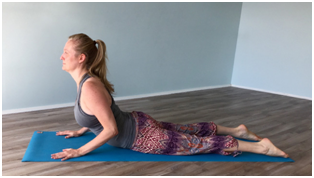 Once you reach full extension, take a breath in and slowly curl up to the starting position. Repeat 10 times slowly and continuously. Lie on your side on the floor and bend knees to 90°. Place the arms out in front with the palms facing each other. Rotate the trunk and slowly extend the arm,and head to look down the line of the arm. Return to start position and relax. Repeat slowly and continuously 6 times.